Sometime ago, I talked about the new SK-II GenOptics Aura Essence to tackle spots and skin clouds before they surface, and the GenOptics Spot Essence, SK-II’s latest spot reducing serum! To see results, it would take about eight weeks of continuous use of the SK-II GenOptics Aura Essence, and six weeks of continuous use of the SK-II GenOptics Spot Essence. During this period, I had stopped my laser treatments for pigmentation completely just for this test. I also took the Magic Ring Analysis before and after the usage. So how did it fair? How well did these whitening skincare products work on my skin? 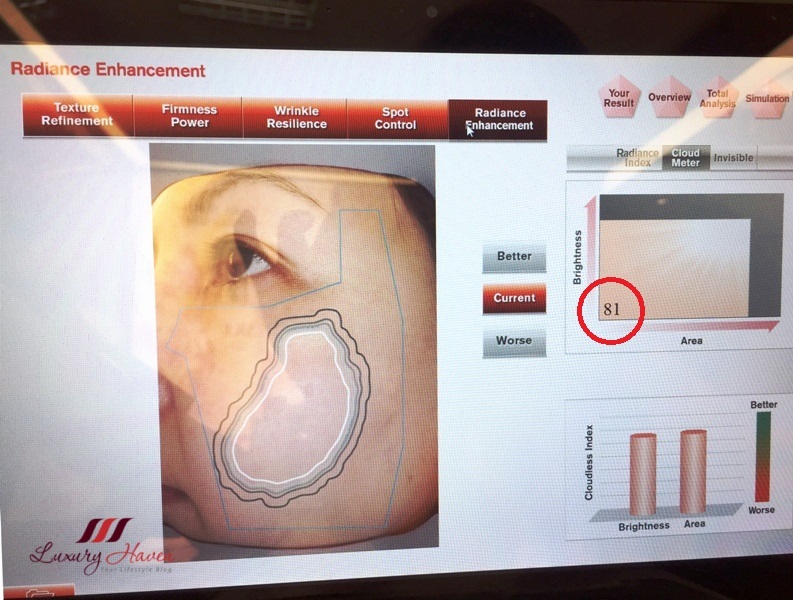 SK-II Magic Ring Test taken on 9 May 2016 Before Usage - 100% across all 5 dimensions: Radiance Enhancement, Text Refinement, Firmness Power, Wrinkle Resilience and Spot Control. Average Score of SK-II FTE User is 83%. My Real Age: 51 years old, Skin Age: 35 years old. 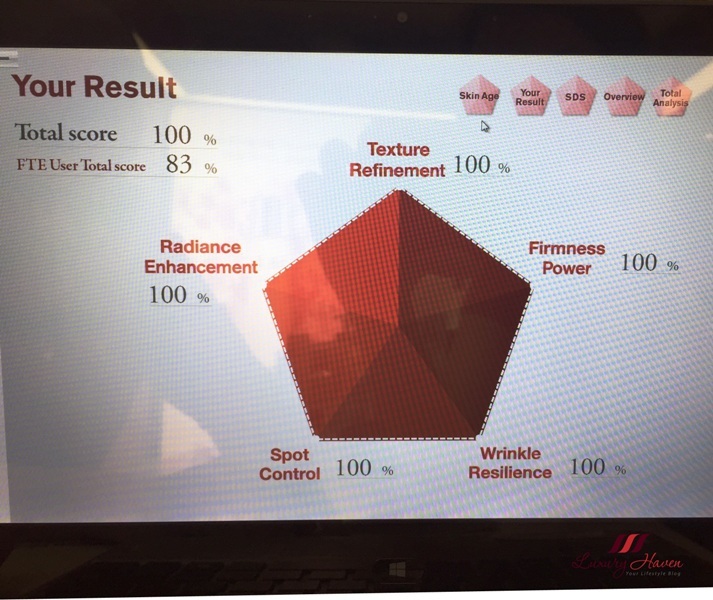 Of course I am thrilled to find that I am still maintaining the 100% scores across all 5 dimensions and have a skin of a 35-year-old! Although I have relatively good skin, it takes hard work to achieve and maintain this kind of result. Magic Ring Test on 9 May and 5 July - It is really hard to compare the scores since both before and after results are also at 100%. Nonetheless, I could see that my Radiance Enhancement Level went up. The brightness level increased from 81 to 85 which is good news! Do you know that hidden spots caused by UV exposure can take years to appear? The hidden damages appear as ‘ clouds ’ within the skin, blocking skin’s natural aura and radiance. If you want to achieve a clearer and more radiant skin, you gotta control those spots lurking beneath your skin. More UV exposure causes damage to your skin, so please wear your sunscreen even if you are at home or in the office! Despite the flawless appearance on my skin, I do have few stubborn spots on the surface not to mention those hidden underneath the skin. So personally, I would suggest a combination of both laser and whitening products for it to work effectively. SK-II is definitely still my Number 1 choice of skincare, as it helps me to achieve radiance and crystal clear skin without the use of makeup. I like how it gives my skin luminosity, leaving my skin soft and supple. I have been a long-time user of SK-II and results are definitely showing in my skin. Have you done your Magic Ring Test? What's your score like, was it up to your expectation? 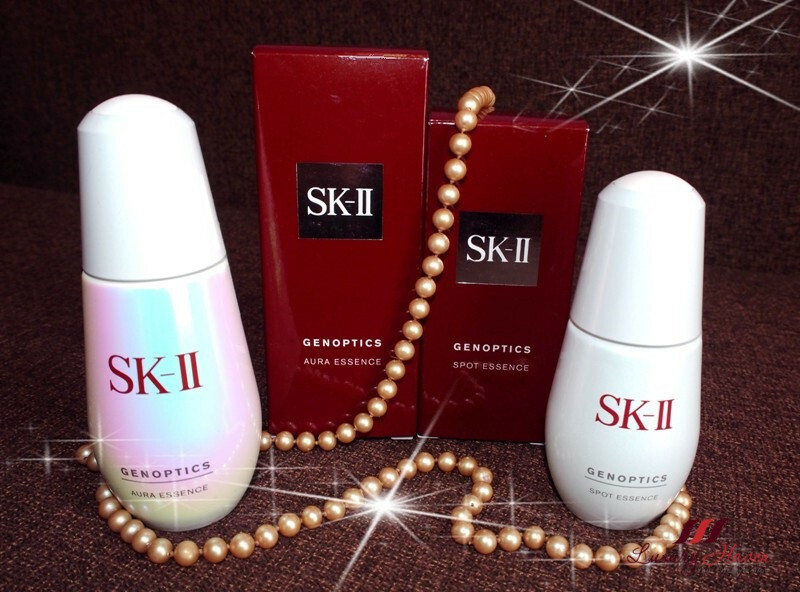 Find out more about the products at SK-II GenOptics Whitening Skincare, The Spotless Discovery! Lots of great food for thought here, Shirley, thank you so much for sharing. I am a strong advocate to keeping the skin if possible flawless. SK II does delivers what they promise. 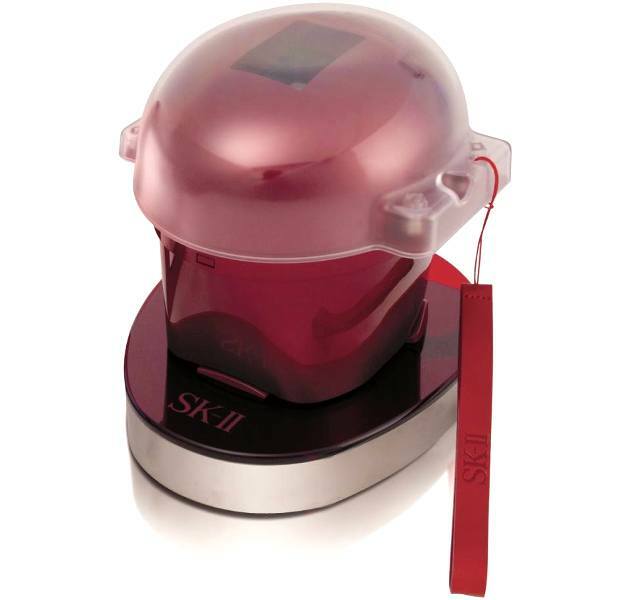 Many people believe and use SKII. Good to see they have more innovative products. 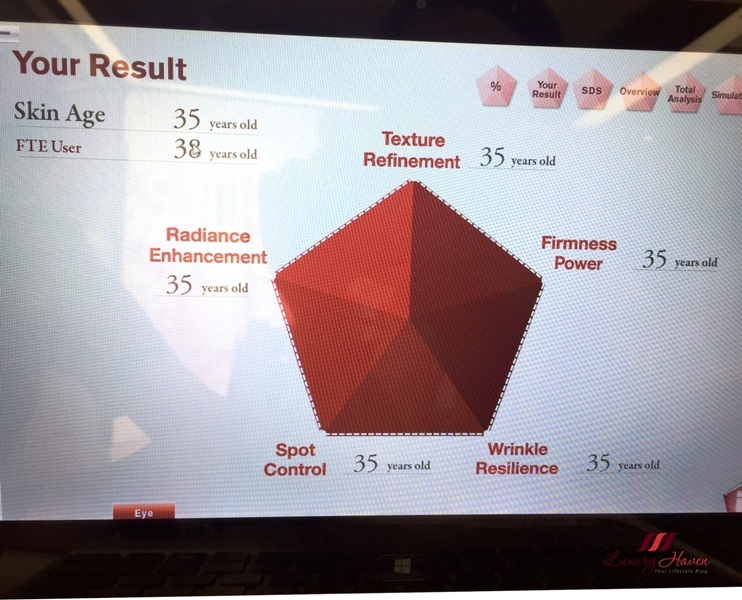 I did the Magic Ring Test awhile ago and my skin age was 8 years younger. I totally want to try this GenOptics Aura Essence. Your results are wonderful! Never heard of this before. Thanks for sharing. I want to try there products, hope I will do it soon. These product have served you well, my friend! You always look amazing! Wow, those numbers are amazing. This is really good! I so badly want to try skII products and this review literally left me craving for these!! Every time you recommended a product, I will always go "I must try" - really so envy of your good skin and the fact that you don't need any makeup to look good. Luckily you reminded me to put on sunscreen even when at home...otherwise I wouldn't even know. No wonder you have such flawless skin! Great review,have never done this test.May be I will try it someday. Seems like this is perfect product for me too :-) Happy Sunday! I have heard so much about the SK-II I would love to try their toner though! these results are very impressive, they certainly seem very promising! A very interesting post , !, Happy Wednesday !! !